Are there people in this world who think the Bible proves God’s existence? The answer is almost certainly YES. I would beg to differ with them, and so would many thoughtful, wise Christians. Proof is for mathematics and logic. How do you “prove” there is a Great Being outside of our universe? Do we look for footprints in a riverbed? Do we examine evidence under a microscope and say, “Aha! There’s God!”? That would be the wrong approach. If God exists, he would be beyond our universe, non-material, and transcendent. 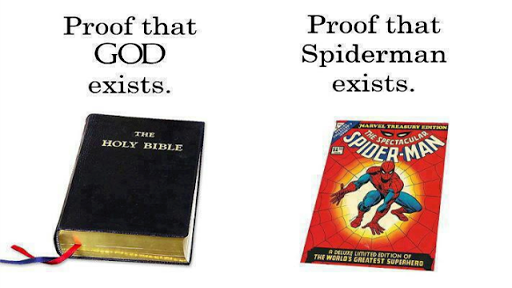 That’s still not proof for God’s existence, of course. And I firmly believe there NEVER will be definitive proof. And I’m fine with that. Christianity has never provided proof; Christianity is about a mixture of reason, evidence and faith. Why am I good with a lack of definitive proof? Because if such proof existed, the freedom to be an atheist — to declare there is no God and the future of this planet is all up to us horribly greedy, immature, violent and disloyal people — would be destroyed. And if the state of this broken world tells me anything, it’s that God prizes the gift of freewill. No matter how often we spit on it. I’m given a choice of whether to believe that Jesus, and all the accomplishments the Bible declares He did while physically on earth, is for real. I’m given a choice on whether to accept that Jesus’ death on a Roman cross makes up for all the wrong things done by His followers and all the right things His followers fail to do. I’m given a choice on whether to trust that by declaring Jesus as my Lord and Saviour, I’ll spend eternity with Him in the presence of the Creator of the universe. One thing I already know: my life is better because I believe in God and follow His Son. Because of that belief, I’ve forgiven people that others have been unwilling to forgive. That belief has also had a profound, positive and life-changing influence on my career, who I married and how I think about this world and everyone in it. Are there times when maybe you need a new and positive influence in your life? Yes or no, post your thoughts below and let’s have a conversation. No proof necessary. It’s all about faith. Another good one Frank. I think many fail to grasp what I interpret as the true notion of ‘seeking’ Him, ie; in the good actions and intentions of yourself and others.